18 Months No APR is really good advantage for those who don't want to pay interest rate for a long time. 13.49%-26.99% can be a good rate or bad depends on your creditworthiness. %3 balance transfer option is very good for those who wants to use this card for balance. There are no rewards in this card. Also no bonus available with Wells Fargo Platinum Card. There is not much unique services. 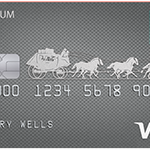 You can check our review for Wells Fargo Platinum Card below. If you have any questions regarding to this card, please ask us. We are going to respond you as soon as possible. The cash advance APR is 25.99% to 27.99%. It is already default Wells Fargo rate for cash advance. The late payment fee is $37. Cash Advance rate is 5%. 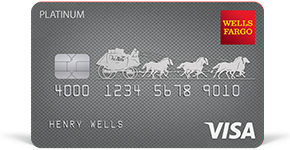 Wells Fargo Platinum Card is very simple credit product. It is a visa card and there are some additional features of it. You can check visa benefits page for this. Unfortunately there is no rewards, bonuses, cash backs for the card. So you will not able to earn anything which you purchases. The card doesn’t ask for annual fee from consumers. So this card can be a good opportunity if you are looking for a no APR credit card with no annual fee. There is a foreign transaction fee that you will need to pay for your each purchase. It is at 3% rate at the moment. Balance transfer fee is %5 for the card. However this rate is 3% for first 4 months after you get the card. This is a good card for those who are looking for a long-term no APR credit card with no annual fee. The card’s current interest rates are high and there is not any bonus or rewards of the card at the moment. You can read some users reviews of this card below. Our user reviews are determining rankings and score of the cards. Please leave a fair review to help other consumers.